Wood Destruction by a Woodscrub: Card Scrapers - Why you want to use 'em! A while back I was going nuts. I usually love sanding as part of woodworking, but I was extremely frustrated trying to sand a purpleheart inlay flush with a maple binder. The purpleheart was just so dense it was taking forever! 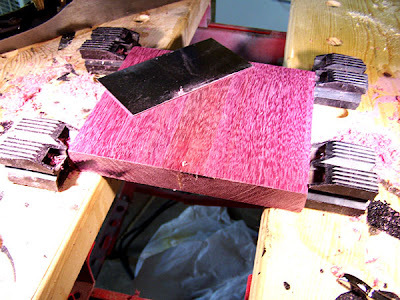 A post over on Woodnet got someone suggesting getting a card scraper to get that purpleheart flush. I'd been wanting one, but never had a need for it. Until that day. I bought a set for $20 with 4 different scrapers, and dropped another $20 on a burnishing rod. After playing with them and learning how to sharpen a card scraper, I discovered something: They make the wood SMOOOOOOOOTH!!! Not just dense woods, but even pine is given a nice treatment with the scrapers! I'm not going to give step-by-step instructions on how to sharpen or use a card scraper. There are plenty of sites out there for that. Google it up. What I will tell you is that this is absolutely something you want to learn. Properly sharpened and used, a card scraper will create a smoother surface than most power tools, and smoother than you can get wood with sandpaper (without burnishing it and hurting the woods ability to absorb stain). Plus you have much more control over the tool than you do with a thickness or surface planer. You can remove material in a very precise manner, getting just the area you want, and leaving the rest untouched. The photos attached to this post are of some edge glued purpleheart I'm using to make a coffee grinder using one of the Rockler Coffee Mill mechanisms and the free plans they provide. I am scraping the glue as well as bringing the two pieces into a more perfect alignment. 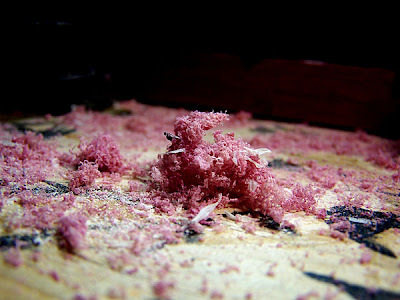 The second photo is of the shavings after just a few passes with a scraper. You want tiny fluffy curly shavings. Not dust. The scraper is more like a micro-planer and cuts instead of scrapes. Using a card scraper will improve your woodworking and ease up on your use of sandpaper. Give one a shot! You don't have to buy the stuff I did either. Any bit of hardened steel can act as a burnishing rod, and individual cards are around $5.